With a maximum capacity of 11 tons, the MCT 205 is easily handling the lifting of formwork, rebar, and precast concrete pillars for the building’s construction, with loads weighing up to 2.2 tons. In addition to general lifting work, the crane is also pouring concrete. 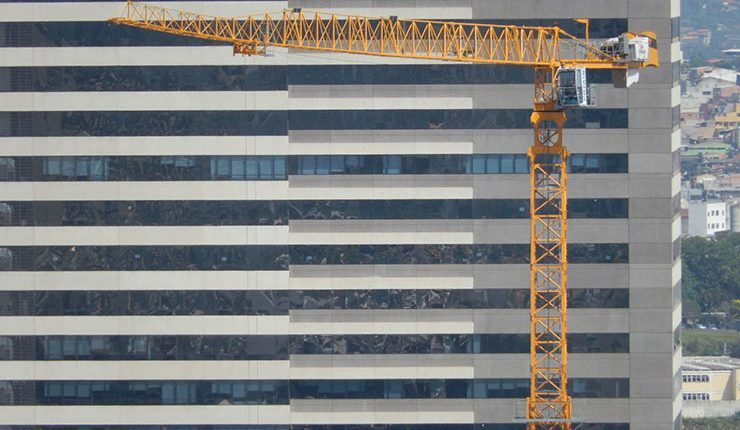 Also aimed at saving developers’ time—and consequently increasing customer return on investment—is the crane’s inventive design, which makes it quick to erect. The MCT 205’s heaviest group of components weigh just 8.7 tons, while the full 213.3-ft. jib can be erected in a single lift. When configured on the 5.2-ft. mast system, the Potain MCT 205 can be equipped with up to 197 ft. of jib to provide a jib end capacity of 2.4 tons. When mounted on the 6.5-ft. mast system the crane can be equipped with up to 2.13 ft. of jib, while the jib end capacity is 1.92 tons. The 5.2-ft. configuration is particularly useful when space for climbing is limited. Floor climbing is available on both mast systems. There is also a choice of two winches for the crane, the 60 LVF 25, which has a rope capacity of 1,804 ft., or the more powerful 75 LVF 25, which has a 2,936-ft. rope capacity is and perfect for high-rise construction projects. The West Corp project, which sits next to the local Manitowoc offices in Barueri, will feature a plaza with space for eight retail shops at street level, and additional customer parking and bike racks, which is meant to encourage healthier and more sustainable lifestyles. When completed, its main tower will offer five different floor plan designs, with spaces ranging from 5,382 to 21,528 sq. ft.